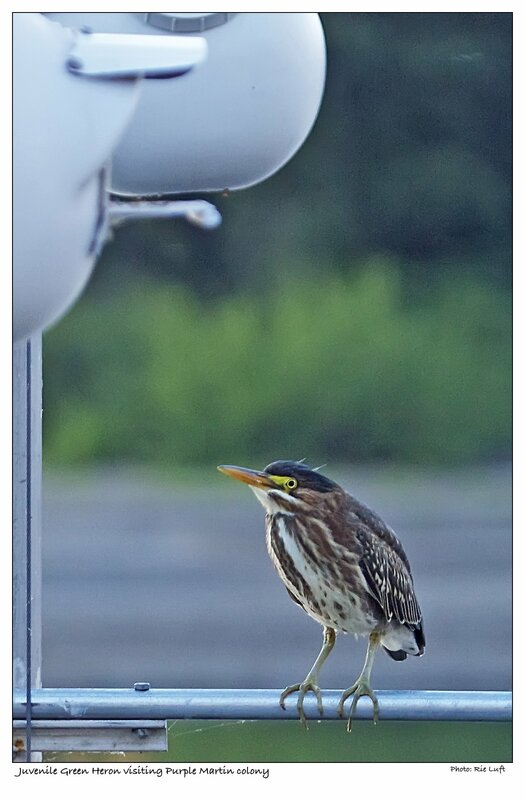 In the summer of 2009, Rie released a juvenile Green Heron in our back channel. It had come to Audubon’s Wildlife Care Center (WCC) as an orphan with no provenance. Green Herons will not self-feed in captivity so it was force fed until it grew old enough to catch fish thrown to him in the hospital area. Deb Sheaffer, the staff veterinarian, asked about OYC’s back channel, as a number of birds have been released in our uplands – those for whom there is no history of location (By law, if the bird’s provenance is known, it must be released back into the same area). As there were no Green Herons in the area, our channel seemed like a likely spot for it. For the rest of that summer it charmed all of us by fishing from our channel tenders. The next summer of 2010 it had developed full adult plumage but had gone wild, staying on the upland bank side and fishing from the overhanging willows, but it also was occasionally seen with a mate. Then the following summer of 2011 a baby was born to them and we delighted in seeing it occasionally with a parent. A favorite experience was watching it one day careening up and down the channel, squawking loudly, as if saying, “Look, Mom, I have wings!” In the summer of 2012 another baby was born to the parents! 2015 saw another baby born and fledged. For the WCC, it really is a special story as so seldom are releases able to be tracked. And for the WCC and all of us at OYC, after all, isn’t this what we at OYC are all about with our WRP and Clean Marina Program – giving wildlife a chance, putting the wild back into the wild for future generations, both theirs and ours? Our OYC story, by the way, was used in Audubon’s Annual Report of 2011, which was a real thrill! In the summer of 2013 another baby was born. Several shareholders were fortunate to see the young in an evening sighting sitting on the crossbar of a martin colony! This year we had several nesting pairs, one with a brood of 16! A large number made it to adulthood. We are so fortunate to have this beautiful bird sharing our habitat. OYC had a full house this year, with 13 gourds occupied, 6 more than last year! Wow! All hatched successfully, with several gourds occupied by first-year martins, i.e. 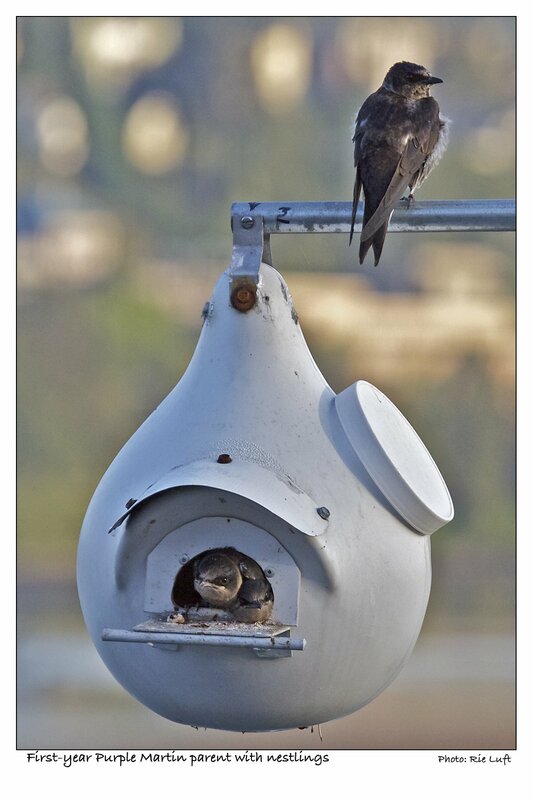 teen-age parents, for an approximate total of 58 young – an average of 4-5 fledglings per gourd. The martins thank our 3 landlords for providing housing. Their song and aerial acrobatics are a constant delight from April into September.